It’s a hot summer day and you’re tending to your yard and when you look at one your beloved plants it looks like your peering through lace! The leaves look like they’ve been meticulous cut so the veins and stem are intact but the rest has been removed! Pretty? Kind of. Healthy for the plant…no! The Japanese Beetle could definitely be the guilty bug to this destruction in your plant! 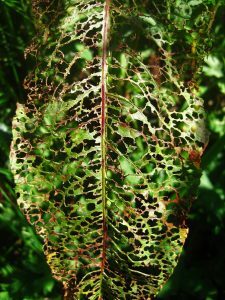 Leaf eaten by bugs and looks like lace. 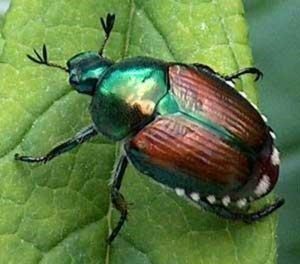 The Japanese Beetle has iridescent green-bronze wings with six small tufts of white hairs on each side and it’s about the size of your small fingernail. They are serious pests in both the adult beetle and the larval grub stages. Adult beetles will eat almost any plant, though they do have preferences, skeletonizing leaves to a lace work. They are above ground, feeding, mating and laying eggs from perhaps mid June to early August. Be aware that they can fly! The white ‘C’ shaped grubs spend most of the rest of the growing season eating the roots under your lawn, resulting in brown patches that increase in size with time. Fortunately there is only one brood each year. Ways to get rid of them! 1.One organic method of control is to simply hand-pick them. Hold a small bucket of strong soapy water under the bug and tap or shake the critter into it. You will need to be diligent about this, visiting your plants as often as possible and inspecting carefully. Do not squish them! They are attracted to the scent of their own kind! 2. Another organic method is to cover your plants with a physical barrier such as fine-mesh screening fabric. Light-weight spun bond coverings (aka ‘Floating row covers’) are available for this purpose at Drummers. Of course this method couldn’t be used for trees, but for bushes and smaller plants it would work well. The important variable is that it’s ’breathable’ to allow moisture and as much light as possible to pass through. Remove the covering as soon as beetle season is over. Do NOT use plastic. 3. One of the most efficient methods of reducing Japanese Beetle numbers is to treat your lawn for grubs. There are both organic and chemical products available. Although killing grubs under the lawn this summer will not affect the number of beetles this year, their numbers next year may be reduced! Prevention is key with a lot of gardening problems! A granular or liquid Systemic Insecticide can be applied to lawn and around non-edible plants to kill Japanese Beetle grubs and the adult beetles when the plant roots absorb the insecticide, an example would be Imidacloprid. The annual version is a good preventative to have in place when the female Japanese Beetles are laying eggs in the lawn in mid-summer. Topical insecticides can be sprayed directly on plants and range from organic insecticidal soaps and Neem products to permethrin and contact insecticides. If you are spraying edible plants, be sure the product is labeled for those plants. Be aware, however, that these are ‘broad-spectrum’ insecticides that affect many kind of insects, including bees and butterflies, so use them cautiously, applying only when and where needed. Keep these insecticides away from ponds and streams as well. 4.‘Milky Spore’ is a biological agent that is specific to Japanese Beetle grubs; it does not harm earthworms, other insects such as bees and butterflies, pets, humans or other animals. It does need one or more applications annually for three to five years to adequately inoculate your lawn, but once appropriate levels are in place, no further treatment is needed for as much as 10 years. 5.Beetle Traps – You can also try to trap them during the time they are emerging. Adults usually emerge between early June and late August. Also, do not place the traps near your favorite trees and garden. The USDA recommends putting them at the border of your property and throughout the community. You may have to get your neighbors in on the trapping! Please let us know your questions or if you need help fighting off these buggers!